Pratchett suffered from Alzheimer’s and it’s been speculated that Neil Gaiman wrote most of the final books in the series. Pratchett died in March 2015. The last, Raising Steam (#40), was reportedly written by his daughter. You can easily tell that Pratchett didn’t have much influence in the writing. I’ve read the entire series and my favorite is #33 Going Postal. Overall it’s a fun series with a lot of satire along the way. Terry Pratchett is hilarious. The books vary in quality but I enjoyed all the ones I have read at random times over the years. Interesting Times is probably my favourite. The great thing about reading these books in order the first time through is that you see the progression and development of the writer. Reading the later books and then some the early books is a bit more of a shock. Once you read them in order, it is fun to put them together by the sub sets and you get several, shorter, series of books. One of my favorite authors and I’m still so sad he is gone and we will never have any new Discworld books. Many, many years since I read this, though I remember enjoying it a lot. I tried to read all the Discworld books in order, but I only made it to about the 4th (entirely my own fault). If I remember rightly, the second book is basically Part Two of Colour of Magic. 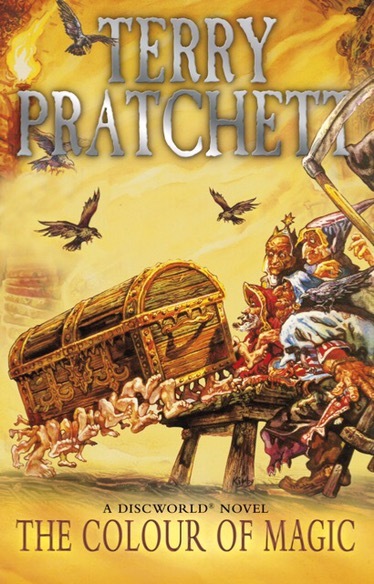 Talking of Pratchett & Gaiman, the book they wrote together, Good Omens, was my absolute favourite for a while. It’s about “the birth of the son of Satan and the coming of the End Times”, but it’s funny! I don’t think I’ve ever actually read anything by Gaiman (maybe a short story), so I think Good Omens definitely feels Pratchett-y.